Peter Pan is perhaps one of literature's most over-romanticised characters, glossed over and sanitised in countless productions through the years since the publication of J.M. Barrie's source materials. Rather than being a spritely, joyful ingenue presented in many re-tellings of the tale, Pan is a mean-spirited, cowardly, selfish and tragic figure prone to rage and selective memory. 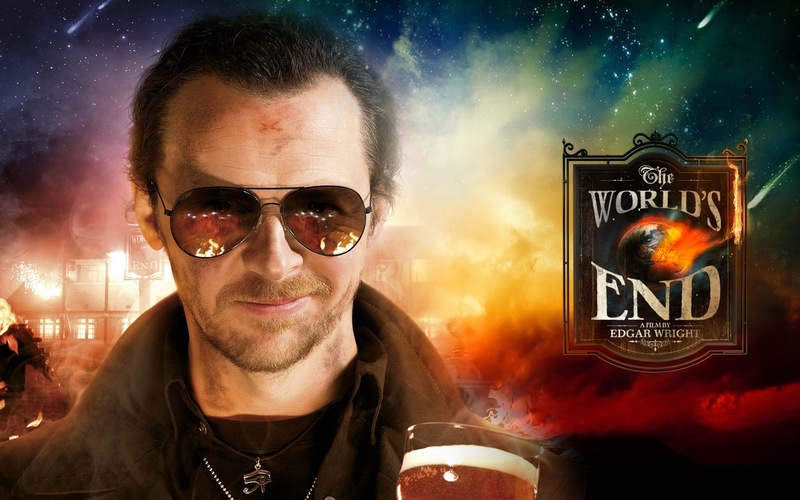 This, rather than the cleaned up version, is the same role Gary King (Simon Pegg) takes in The World's End, Edgar Wright's winning satire on the commodification, homogenisation and franchise-friendly repackaging of modern society. King was, in his high school prime, the leader of his own group of lost boys. Their escapades attained, at least in King's eyes, legendary status with a planned twelve pint pub crawl representing the peak of their youth and, indeed, lives so far. About to enter middle age and with nothing to look forward to, The World's End's nominal protagonist makes the decision to instead peer backwards and see if he can recreate that magical night once more. The gang, however, have all grown up and have little to no intention of recreating their glory days but, due to a sleight of hand and a "little white lie" or two, King manages to get the band back together for one last pub crawl. Twenty some years later it becomes clear that, despite an artificial look of similarity, their old home town of Newton Haven has changed somewhat. Each of the pubs they frequent on their journey, so vividly full of individual character in their memory, had been uniformly replaced with sterile counterfeits - the town had become a victim of "Starbucking", the process of adding countless chain outlets across the globe and the effects that such a spread would have. Whilst each new pub was quietly efficient, there was, as far as Gary could tell, something missing - perhaps a soul. In fact, as Andy (Nick Frost), Oliver (Martin Freeman), Peter (Eddie Marsan) and Steven (Paddy Considine) seem too to have grown up, moved on and forgot the good old days - could it be that perhaps Gary is the only one still frozen in time at a point in his youth which might never have existed the way it did in his mind? Could the Sisters of Mercy t-shirts and Soup Dragons mixtapes be a symptom of false nostalgia? For the first section of the film, Wright showcases us exactly what the real life version of a man-child is actually like. Whilst Hollywood have produced countless features in recent years in which the audience is encouraged to root for the juvenile male lead caught in arrested development (from Adam Sandler through to the Frat Pack), the real life versions of these boors are much less charming than Owen Wilson, for example, and much more full of avaricious egotism like Gary King. Here, Pegg is in top form as a horrible sociopath, willing to do anything, lie, cheat or steal, to inveigle his former best friends into sharing with him the experience of actually being young again - whilst everyone else has matured, King's Peter Pan-like stoic and cowardly refusal to grow up has left him alone in the world, filled with anger and sadness. It's a beautiful character study, sad and true, which gives the sudden narrative twist the emotional weight which is needed to underpin the rest of the film. The World's End's raisin d'etre becomes apparent when, a handful of pubs into the pub crawl, and with the evening looking like it will fall apart due to King's lack of empathy for more mature concerns, the group find themselves involved in a pub toilet showdown with a group of robots. Nearly all the locals of Newton Haven, it would seem, have been replaced by mechanical replicants and the final destination for the drinkers, The World's End, may have taken on a rather literal meaning. Trapped in a world of robotic, conformist people, and cloned, identikit chain pubs - Newton Haven sounds like a rather relatable hell. It's a pert and clever allegory which pits the idealism of youth against the conformity of aging; a society which favours bland branding over character of any form. If Ozu hadn't already used the line, "Isn't life disappointing?" would have made a neat summary of the band's situation. Not, that is to say, that The World's End is all doom and gloom - as to be expected from the trio (Pegg, Wright and Frost) who brought us Shaun of the Dead and Hot Fuzz, their latest adventure is packed full of both chuckles and more hearty laughs too. Despite playing a new character in this outing, Pegg, it would still seem, has the same hilarous troubles vaulting fences he has in previous features. The dialogue, too, has real pangs of authenticity and there's some delightfully British turns of phrases, used to insult one another also from a cast who are all on top form (with special praise for Nick Frost's injured bear Andy - easily his best turn to date with a layered and nuanced performance). Whilst, due to the pop culture references and love of genre, some could see the film itself a celebration of the juvenile - it is something much more than that. It's a recoginsably British comedy with real wit (rather than America pleasing stereotypes), heart and something to say and the intelligence to say it. Yet, on top of this, there are pratfalls and in jokes and character arcs which begin and end with a hero unwilling to grow. It's easily the best part of the "Cornetto trilogy" by Pegg/Frost/Wright and, once again, the trio have shown audiences it's possible to make a British comedy which can be clever and funny at the same time. There's no more excuses for films like Keith Lemon any more - the bar has been raised permanently. Fantastic summary and review! I saw The World's End last night and I absolutely loved it! I found the "resolution" and the ending quite weak, but the rest of the film was funny enough to make up for that! Thanks for your kind words - glad you liked it!